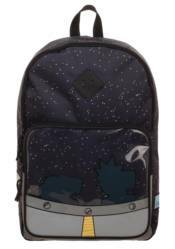 You'll never be in a pickle when you've got this Rick & Morty Backpack by your side! Made from black canvas with a printed view from the Space Cruiser, this backpack features a zippered front pocket, large capacity main compartment, and top carrying handle and adjustable padded straps. Wubba-lubba-dub-dub, yo!